There's a great article running in the sports section of Thursday's New York Times, "Tension Boils Over Between Sprint Rivals" (posted online today), about two swimmers going head to head tomorrow at the Charlotte UltraSwim for a spot on the U.S. team in this summer's FINA World Championships in Shanghai. Cullen Jones, who I've interviewed and written about before for magazines and this blog, is competing against his SwimMAC Carolina teammate Josh Schneider in a 50-meter freestyle swim-off on Thursday during the first day of the 27th Annual Charlotte UltraSwim, which takes place May 12-15 at Mecklenburg County Aquatic Center in Uptown. This Charlotte event has become one of the most popular of the USA Swimming Grand Prix meets over the last few years, and it's once again attracting the biggest names in the sport: Michael Phelps, Natalie Coughlin, Ryan Lochte, Charlotte native Ricky Berens, and several others. For more details, visit www.charlotteultraswim.com. And you're in luck. 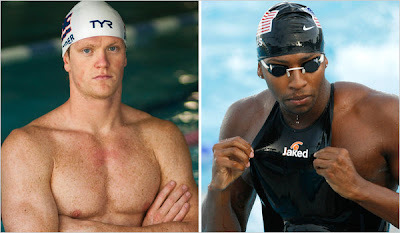 WCNC channel 36, our local NBC affiliate, will air Jones and Schneider's swim-off live during their 6 p.m. newscast. The race, which will only last about 22 seconds but is uber important because it's the winner's path to the national team and 2012 Olympics, is scheduled to run at 6:20 p.m. You'll also be able to watch several of the competitions over the three days online on USA Swimming's Ustream channel. Swimmers train harder than athletes from many other sports, but they don't often receive recognition outside of an Olympic year (2012 is highly anticipated for the U.S. because of what they did in 2008). So it's great to see Charlotte-based SwimMAC Carolina getting such well-deserved media coverage. The swim club puts on this annual event, and several of the swimmers competing this week are trained by the club and its legendary director David Marsh. Click here to read the article I wrote about him and SwimMAC in 2009 for Charlotte magazine.